Many of you will know that we sponsored Ronnie (Wood) as our parting gift to Woodstock. He was one of over 80 hares dotted around the cotswolds celebrating the 2017 Cotswold March Hare Trail (http://www.cotswoldsharetrail.org.uk). 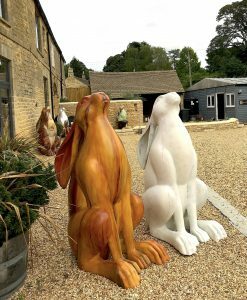 At the end of the year all the hares were offered for sale at the charity auction and we were very pleased to secure Ronnie so that he could reside outside our new Chipping Norton home. We also bought a number of other hares with a view to finding some their ‘forever homes’…and some to keep Ronnie company! 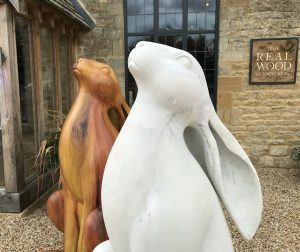 Whilst some of our other hares are beautifully decorated, in our opinion, none come close to the organic majesty of Ronnie – beautifully painted by artist and friend Rod Craig, creating a master piece that looks like it has been hewn out of a solid trunk of yew wood. Although Ronnie gets on with his ‘harey’ friends, they’ve never quite felt like ‘family’ to him…so we thought it was time to introduce him to his sister. Our ‘blank canvas’ hare will be painted by Rod over the weekend of August 18th & 19th, 12-4pm on both days and before our very eyes (and possibly yours too) ‘Sher’ will be brought to life. Why ‘Sher’?…Sher-Wood as in Sherwood Forrest! for a glass of prosecco and to watch Rod at work! We are currently hosting ‘Remain in Light’, an exhibition of Rod’s latest paintings in watercolour, ink, acrylic and oils (www.rodcraig.com) and of course there is some fabulous furniture to view as well(!) 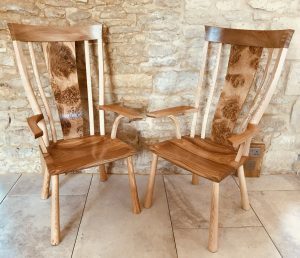 including our latest ‘Shark’ armchairs featuring fantastic English burr oak splats and gorgeous Scottish elm seats and top combs.